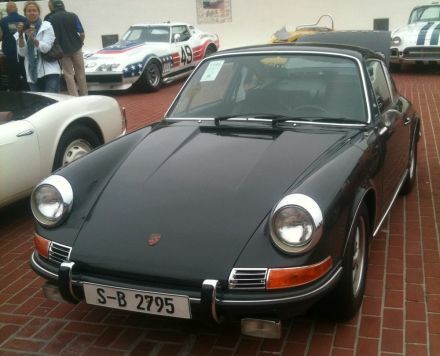 In case you have not heard, a 1970 Slate Gray Porsche 911S just sold for $1,375,000 at the RM auction in Monterey, CA. As the owner of a 1970 911, I was at first ecstatic to see that the value of my car had risen exponentially overnight. I prepared to call my classic car insurance agent to adjust the value promptly. However, hopes were quickly dashed as I realized that my car lacked a certain element that the auction car posessed. It belonged to Steve McQueen. It was the same car he drove in the beginning of the movie Le Mans. It is almost certainly the most famous 911S ever, and perhaps the most famous Porsche 911 streetcar ever. However, I have watched Le Mans about 47 times and I have a poster of McQueen, I watch the modern Le Mans races on TV every year, I have a cousin named Steve, and I ride motorcycles (just like McQueen). I even drive my car in spirited fashion early in the morning through sleepy little towns and farmland. If you squint a little, it could easily be France. I have calculated that this combination makes my Silver (which is just a shiny version of gray really) 911T Targa worth at least $127,458 . Serious offers in that vicinity are now welcome.